Dr. Raluca Mateescu does research in the area of beef cattle, sheep and goat molecular genetics. Most biological traits of economic importance in domestic animals have a complex inheritance (are influenced by many genes and the environment) and the long-term research goal is to unravel the genetic basis for the phenotypic variability in this type of trait. Her research uses recent advances in the animal genomics field with the goal of improving animal production efficiency and enhancing animal products for improved human health. Consumer satisfaction and willingness to purchase the product again in the future are largely determined by the quality of eating experience at consumption. To address consumers' demand for high-quality product, the beef industry needs to use all tools at its disposal to deliver a product with superior eating quality and implementation of an effective genetic improvement program is a critical step toward this aim. Palatability is not based only on one characteristic, but is based on the relationship of three characteristics - tenderness, juiciness, and flavor – and how they work or do not work together to determine beef eating satisfaction. These traits are impractical to improve through traditional selection (difficult and expensive to measure), but are ideal candidates for genomic selection if genetic markers that account for a worthwhile proportion of the variation could be identified. In this webinar Dr. Mateescu will focus on use of SVS program to perform genome-wide association studies for individual traits describing beef palatability, identify chromosomal regions associated with these traits, estimate genomic breeding values and predict the accuracy of GEBV for palatability traits in beef. 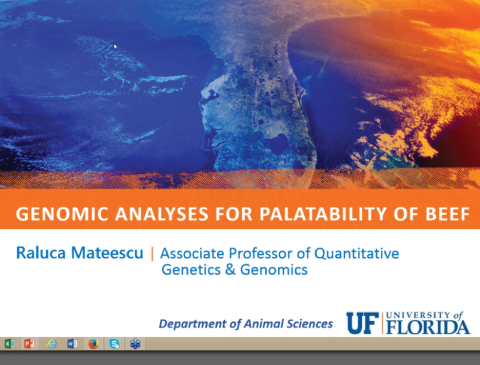 Dr. Raluca Mateescu is an Associate Professor of Quantitative Genetics and Genomics at the University of Florida. Dr. Mateescu earned her M.A. and PhD at Cornell University in Animal Breeding and Genetics. Before coming to UF, Dr. Mateescu was an Assicate Professor at Oklahoma State University and conducted postdoctoral reasearch at Cornell. Her research is focused on beef cattle, sheep and goat colecular genetics.